Pamphlet published in 1638 by John Taylor. A scurrilous story of a woman scorned and what she and her friends did to the woman in Covent Garden who had spent a night with her husband. 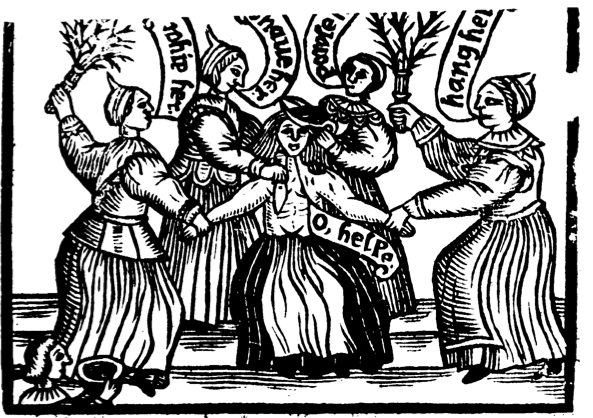 What is really interesting is that this picture seems to be the original woodcut that was used in the Discovery of Six Women Preachers” that I blogged about previously. The story even mentions a serving boy who goes for a bowl and razor who features in the bottom left hand corner. 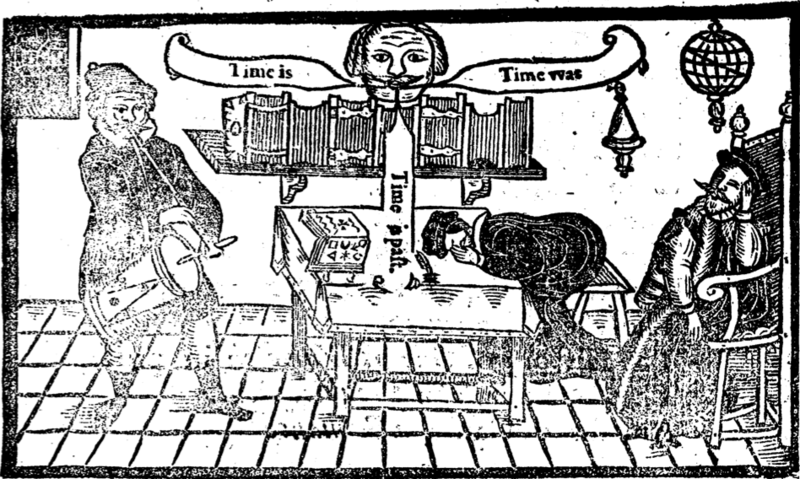 Sadly the image is incomplete as the top part is covered by a scale, but it’s obvious that this is the original, there are no alterations in the woodcut and the image makes more sense in the context of this story. Nice costume details on the women’s petticoats too. The woman on the right wears a simple petticoat with bodies joined to the skirts, whilst the two on the left wear waistcoats over the top. The poor woman being whipped in the centre has a petticoat with separate skirts, or at least one where the body can be easily detached. Good selection of pointed coifs too. or Paie your Groat in the Morning. Satirical single sheet publication on the dangers of drink printed in London in 1652. Barnaby was a proverbial name for a drunkard and he is definitely the worse for wear, being comforted by a fox after a long night. 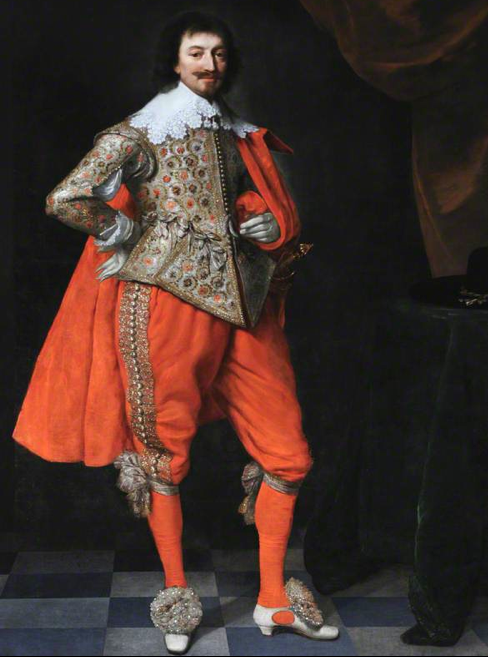 He is fashionably dressed though for the early 1650s, with a short doublet under which you can see his shirt and ribbon decoration at the bottom of his unconfined breeches. Nice rosettes on his shoes and notice the detail of the construction of his cap. Sadly, lying dead. 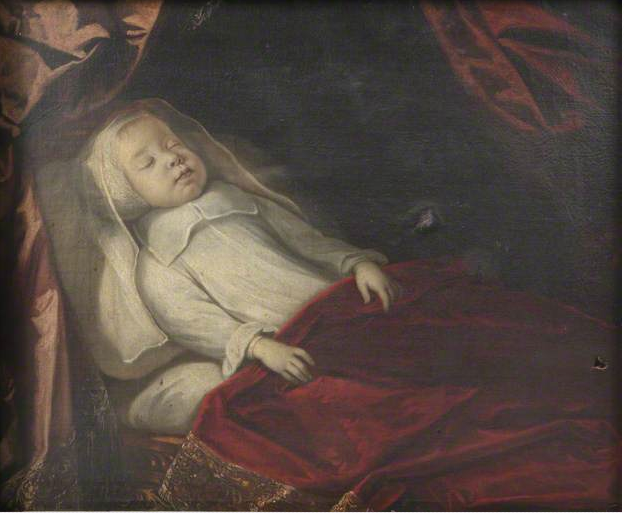 Painted by an unknown artist in 1638, this rather gruesome image probably acted as a remembrance of this unnamed brother and a memento mori to the rest of the family who presumably saw this painting on a daily basis. It’s another example of someone in their shirt only, very much like Sir John Eliot who was probably dead by the time his painting was finished. The poor lad is also wearing a linen cap and a falling band which may in this case be a permanent attachment to the shirt. This picture hangs in Hardwick Hall Derbyshire. 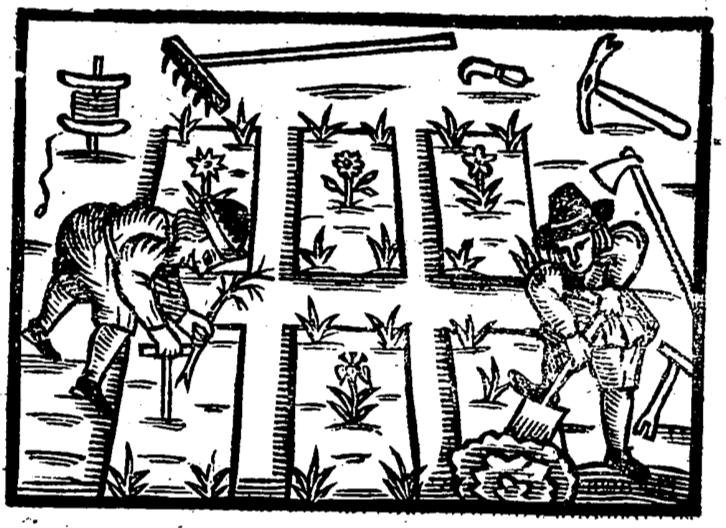 Originally printed in the 1500s, this was one of the first practical gardening manuals. It was “corrected and enlarged” for a modern audience and reprinted in London in 1657. This is one of the illustrations. Two gardeners are working over a section of raised beds. The left hand one is planting something spiky and seems to be wearing a lace edged day cap, whilst his comrade who is doing a spot of digging wears a more conventional broad brimmed hat. Both are wearing plain shoes, boots would have marked them out as common labourers rather than skilled gardeners. 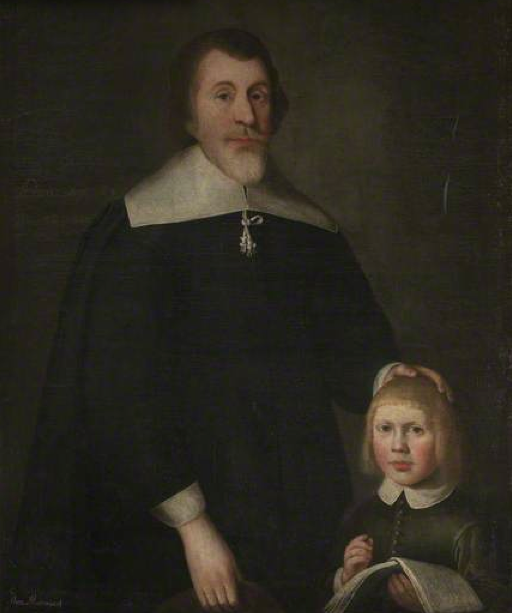 Painted in 1640 by an unknown British artist, this portrait hangs in Oxborough Hall in Norfolk. It’s not at all flashy and the details are tricky to spot, but it’s a really nice image of two people in their best clothes. The man is dressed in his best black suit and cloak with a plain, shoulder wide falling band with knotted bandstrings and matching cuffs. He looks like a cleric, but he could be any kind of professional. The boy is in dark green. 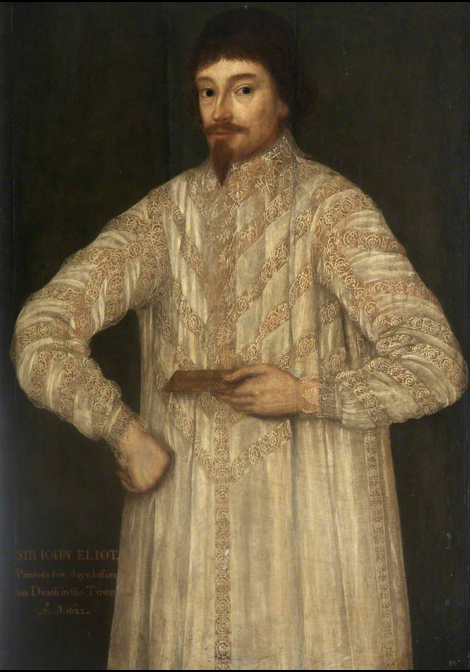 We can only see his doublet and the smaller linen band that just about covers the standing collar. 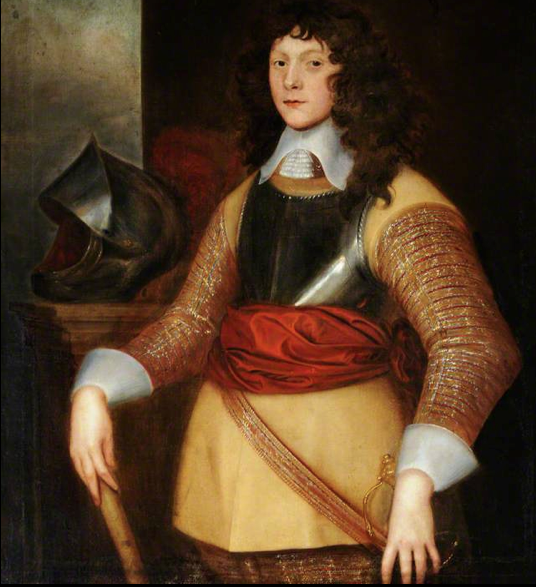 Born at Chatsworth in Derbyshire, Cavendish was a the second son of William Cavendish second Earl of Devonshire and served as prominent officer in the royalist army. He was killed in battle in 1643. He is painted by an unknown artist as very much the high status officer with buffcoat and breastplate armour. His breeches and doublet sleeves are almost completely covered in braid, and although he has a very plain falling band and shirt cuffs, the tassels on his bandstrings are very fancy. His red scarf is tied horizontally across his waist, the standard manner for buffcoat and armour. The original hangs in Hardwick Hall in Derbyshire. Scurrilous pamphlet first published anonymously by Henry Neville the politician and political writer in the spring of 1647 that made fun of the prominent women who were associated with the parliamentarian cause. 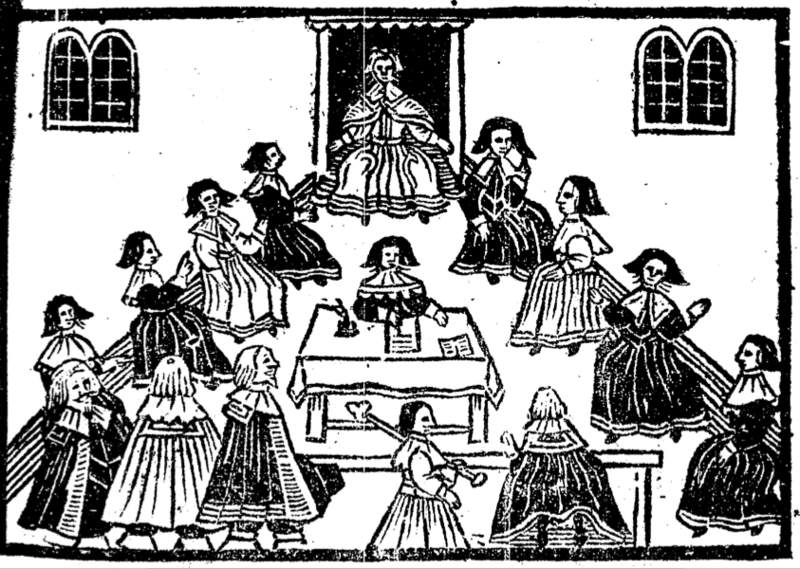 The woodcut is a bit crude, but there are enough details to see that these are women of quality dressed in bodice and petticoats, uncovered hair and large linen bands or kerchiefs. Note every skirt is edged with at least two lines of braid or ribbon.